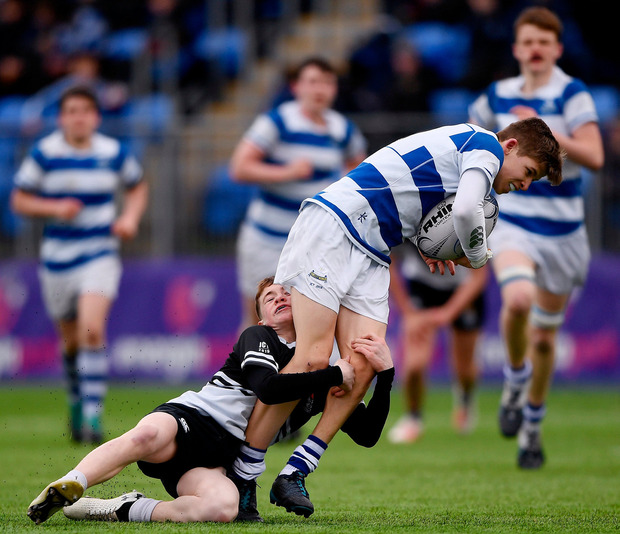 Although 33-point winners by the end of this semi-final, only five points separated Blackrock from Newbridge College at half-time. 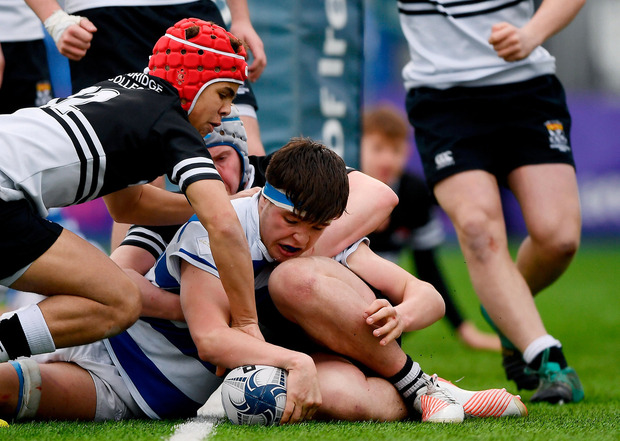 In earlier rounds, the Kildare school had shown a remarkable resilience under pressure before, on both occasions, getting late tries to steal the win. And the manner in which the first half played out at Energia Park yesterday, they were on for a hat-trick of smash-and-grab victories. A second-minute try from Lucas Berti Newman, thanks to excellent approach play from Harry Farrell, put Newbridge into a shock early lead. That period of bliss was short-lived, the blistering pace of 'Rock winger Ethan Laing saw to that. He dotted down in the fifth minute before adding a second later in the half. Try-scorer Berti Newman was shown a yellow card for a deliberate knock-on in the 39th minute and Newbridge were unable to handle the numerical disadvantage. 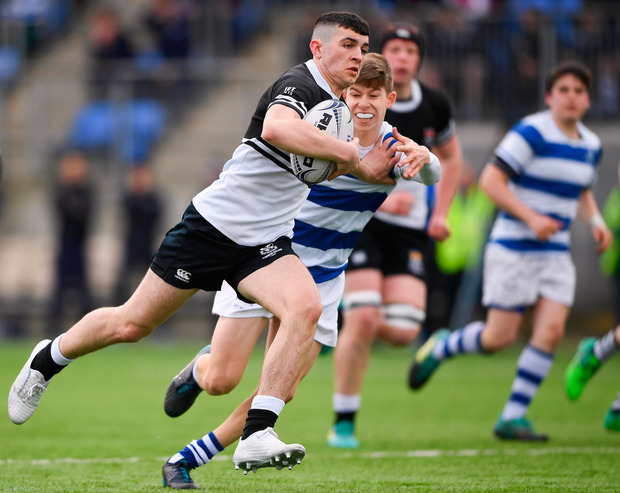 A hat-trick of tries from Liam Molony followed by Jamie McLoughlin grounding by the posts made the end result a flattering one for the south Dubliners. They await the winners of Gonzaga College and St Michael's College in Wednesday week's final. 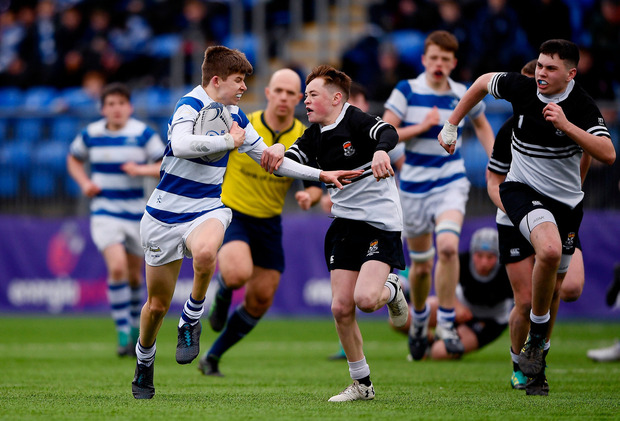 Blackrock College - C Ryan; C Leahy (J O'Sullivan 55), H Cooney, F Mei (D Molloy 54), E Laing; Z Quirke (P van Zuydam 53), W Fitzgerald; C O'Brien (E Gulliver 53), G Barron (M Brophy 52), P McCarthy (C O'Brien 53); S Green, T Brigg (C O'Brien blood 46-48); J McLoughlin (N Kelly 53), L Molony, G McCarthy (capt) (P Foley 49). Newbridge College - M Young (T Bohan 54); D Grant (P Gaire 49), C Corcoran, L Berti Newman, H Farrell; R Dillon, T Brophy; P Stapleton (F Mahon 49), T Waters (P Fata 53), H Rigney (C McCormack 46); D Downing (M Barry 53), C Chanders (R Healy 44); R Byrne, S Fitzgibbon (capt), K Kelly (J Collins 49).